When Ferniehirst last stepped out in the Country Championships Preview at Port Macquarie she blew the field away. After pinging out the gates she set the pace, then let down to win by more than five lengths. While her Coffs Harbour trainer Paul Smith isn’t expecting a repeat in this Sunday’s Country Championships Qualifier at Grafton, he believes at $18 she’s over the odds. “She’s fit and well, she looks the best she has ever looked and her work has been great during the week,” he said. Ferniehirst is enjoying her most successful preparation yet with two wins from three starts. Her seventh at Gosford in January was far better than it looks on paper. Four of the horses who beat her have since won a race and the winner, Star Of Monsoon, has been placed at metropolitan level three times. 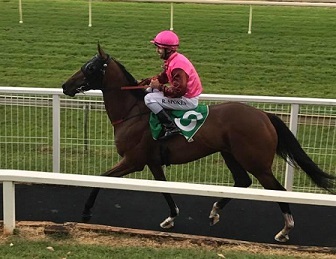 Smith opted not run Ferniehirst again after her Port Macquarie victory five weeks ago, instead giving her a jumpout on 26th February. Ferniehirst returns to scale after a brilliant win at Port Macquarie. Ferniehirst has drawn barrier 12 and while Smith would have preferred 6 or 7 he’s not too concerned. Jockey Ben Looker has had a couple of sits on her for a second and a fourth. She’s won on all surfaces but anything in the soft range suits her best. Matthew Dunn’s flashy gelding Snitz is the odds on favourite for the race having won his last three starts at Doomben. It sets the scene for a potential repeat of last year’s NRRA Country Championships heat where Dunn’s Perfect Dare saluted ahead of $31 chance Free Standing who pulled off an upset win in the $500k final. Smith is no stranger to the excitement of the Country Championships. In its inaugural year Kareem’s Edge came third by a flared nostril in the NRRA qualifier but in a stroke of luck for Smith he scraped into the final when Voltaire was scratched due to injury. He lined up at odds of $61 and managed to finish an impressive fourth in the sixteen-horse field. “That was a great experience and I’m keen to be involved again now that it’s been running for a few years,” Smith said. Ferniehirst is owned by the Kerr family who have had horses with Paul Smith for more than a decade and they’ve rustled up a big contingent of supporters for Sunday. Ferniehirst Castle in Scotland and was built by the Kerr clan in the 1400s. The Country Championships at Grafton are held in conjunction with the Blues, Brews and Barbecues festival with gourmet food and craft beer available for purchase on the day. There’ll be live entertainment and free activities for children starting at midday. View the fields and form for Grafton's Country Championships meeting here.